Speaking of Reagan, more fanart of her! Woah! From Argyle! Tet and Jeff together are adorable, it's almost like watching two puppies. Edit: Also, congrats on 400 pages. Jeff's too innocent for their world. Bwahahaha, he really is. I think I should feel guilty for not letting him enjoy a regular life with puppies and kittens and stuff. 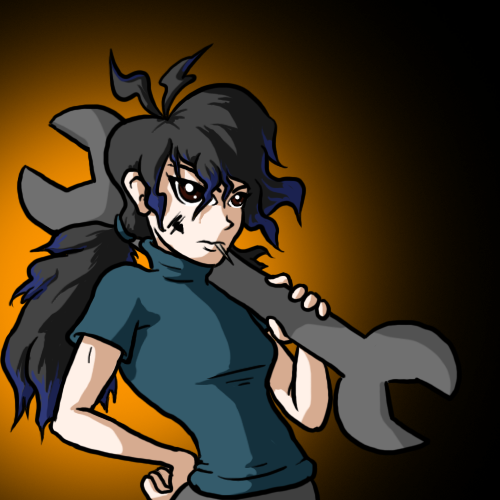 Also, Tet's eyes remind me a lot of Mystery Girl from way back. Maybe she too is a roboto? The suspense! I'm very excited to see how this continues. Now what, pray tell, does Benny-boy have to say? Or is it Eva that coughed? The head? Ah, we'll be seeing... Really soon, here! She seems happy for having the head. Now what could Benjy be wanting, staying behind here? Is Benny planning to add her to the list of girls he kinda likes, but is too much of a wuss to do anything about? Since Tet proved to be quite useless, how about just replacing his head with that one? Might get the data either way and maybe anything else locked inside the robot. Time for looking at garage surprises. In the 7th panel, I think the word balloon tails are supposed to be pointing in the direction of the little face's mouths or are other people speaking?